PHD-DESIGN: All forms of design, including graphic design, multimedia design, architecture, produce design etc. 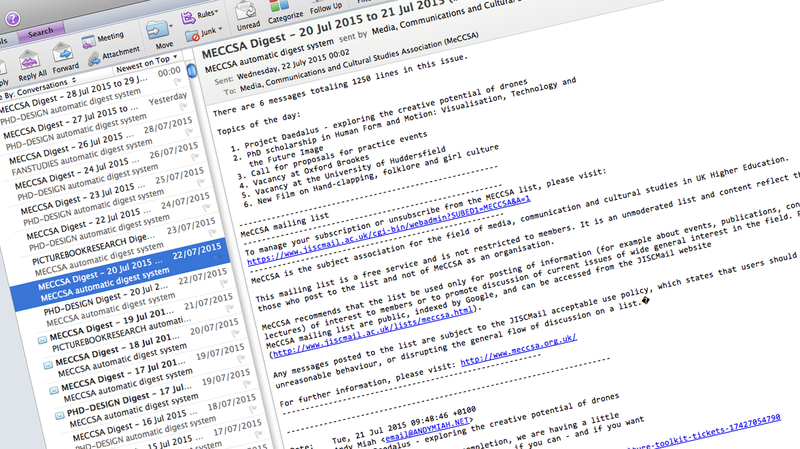 MECCSA and MECCSA-PGN: The mailing list of the Media, Communication and Cultural Studies Association. PICTUREBOOKRESEARCH: Children’s picture books, illustration and children’s literature. H-MATERIAL-CULTURE: Historical and contemporary cultural artefacts and the contexts i which they are used. It also sometimes covers related topics such as product design. DIGITAL-ARTS-FORUM: Web art, interactive art, digital art, visualisation, screen cultures, posthumanism, cybercultures. ILLUSTRATION-RESEARCH: Illustration in the broadest sense: extends to all forms of narrative art. DRAWING-RESEARCH: The UK Drawing Research Network mailing list. ART-TECHNOLOGY: The intersection of art and technology, including digital art, digital display of art, multimedia, cybercultures. FILM-PHILOSOPHY: Associated with the Film Philosophy journal. To subscribe to any of these lists, click the link above and choose ‘subscribe’. I recommend selecting the daily digest option, because some of these lists receive many messages a day and it is helpful to receive them all in a single email.